* About 30% reported implementation of integrated STEM in the core curriculum at the middle/junior-high and high-school levels. 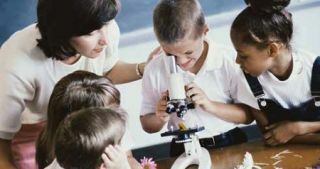 * About 80% were familiar with the Next Generation Science Standards (NGSS), and a majority had a favorable overall, general impression. * Overall there is broad interest in incorporating project-based learning (PBL) as part of science/STEM education. * The most frequently identified challenge facing STEM education was insufficient available technology. * Elementary teachers in grades 4 and above most typically lack access to digital tools, whereas middle/junior-high and high-school science/STEM teachers typically share digital tools. * Teacher professional development (PD) was a funding priority for many STEM leaders and educators, and many perceived current PD for STEM teachers to be insufficient. * About 50% of the supervisors reported that their districts offer PD in STEM/science for elementary-school teachers. * The PD topics most commonly identified as critical for implementing NGSS or equivalent standards were how to incorporate PBL (53.6%) and how to incorporate engineering practices (40.3%). * The most important challenges facing STEM education include insufficient technology (41.5%); class time (37.9%); funding (36.6%); and PD (33.2%).